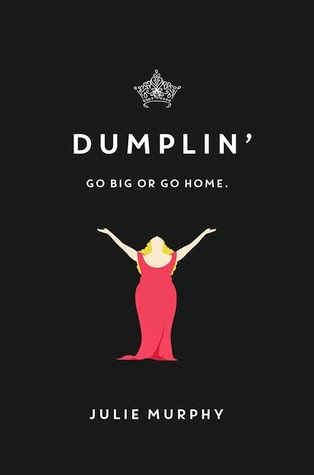 Dumplin' by Julie Murphy. Grades 8+. Balzer + Bray, September 2015. 384 pages. Reviewed from e-galley. High school sophomore Willowdean Dickson has never had a problem with being fat. Despite occasional criticism from her mom, a former beauty queen, Willowdean has always been confident about her body, her right to wear a bathing suit ("her thoughts on having the ultimate bikini body? Put a bikini on your body"*). But when she starts working at the local burger joint Harpy's, she meets Bo, a dreamy Catholic school boy on whom she forms an instant crush. When it seems like Bo actually likes her back, Willowdean is suddenly filled with doubt - about her body and herself. She's also still a little shaken about the death of her aunt Lucy, another woman of size whom Willowdean had always looked up to. As her mom starts sorting through Lucy's things, Willowdean discovers a blank application for the local Miss Teen Blue Bonnet pageant and discovers that her aunt had dreamed of competing. As Willowdean contemplates this, she wonders what else Lucy didn't do because she let her size hold her back. So she decides to do one thing that the fat and ugly girls in her town have never dared to do: enter the Miss Teen Blue Bonnet pageant. You guys. This book. THIS BOOK. This book is the book I want all fat girls to read. No, actually, I want all girls to read it. NO, actually I want EVERYBODY to read this book. This is an engaging story with a realistic, humorous voice and it's a body-positive story without being message-y. It's so easy to get fat girl books wrong, but this one gets it right. Willowdean is funny and sassy, but also occasionally vulnerable. She has some great things to say about being confident about your body, but she also has times when she doesn't love everything about her body, which makes her a realistic character. Plus, it's just a fun story, a little campy at times with its Dolly-Parton-singing drag queens and all the pomp of the pageant world. It's a really enjoyable read. My next-favorite fat girl book is Big Fat Manifesto by Susan Vaught, which is another fat girl book done right but VERY different in tone. Revenge of the Girl with the Great Personality by Elizabeth Euhlberg also touches on the pageant scene as a plain girl deals with being overshadowed by her younger sister on the pageant scene.